The Malta Drive-In Theatre on Route 9 was built in 1949 and has been in continuous operation since. It is one of only 450 drive-ins left in the United States. 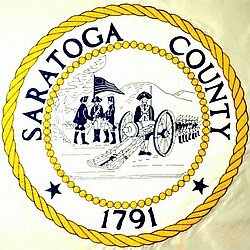 The Saratoga Race Track is the oldest, continuously operating sporting event of any kind in the United States. Standardbred racing began in 1847. Its first thoroughbred race was run in 1863. The track on which that race was run is now the location of the Oklahoma Training Track. The Saratoga Meet originally lasted only four days. It is now a 40 racing day event. There are 22 springs in Saratoga Springs. No wonder it’s called the Spa City. The springs occur on a line where the north-south Saratoga Fault allows water trapped in subsurface shale layers to reach the surface. What candy is sold along with a nickel-plated hammer? A peppermint pig, of course. This bright pink, hard-candy has become a holiday tradition around the world -- the hammer is used to break off pieces of the pig, which is eaten for good luck. You can find these porcine party treats at Clifton Park’s Saratoga Sweets on Route 9. If you can’t imagine eating a whole pig, bite-sized “pink pig poop” is also available. Saratoga Sweets sells 130,000 each holiday season! April usually marks the start of trout season. Seventeen Saratoga County water spots are stocked with rainbow and brown trout. Other species caught in the local area from 49 lakes, 96 rivers and streams, and 25 reservoirs are largemouth bass, smallmouth bass, yellow perch, bluegill, bullhead, crappie, and pumpkinseed sunfish. In the 1800’s, D.A. Foote used to harvest ice from Sylvan Lake (now known as Footes Pond) in the winter and deliver it to Ballston Spa homes in the summer. A photo of his ice wagon can be found here. Footes Pond is one of those in the area, which is stocked with trout during fishing season.